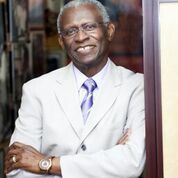 In 1958 Martin Luther King Jr. privately recruited Lawrence Edward Carter as a 10th grader to come to Morehouse College, King’s alma mater in Atlanta, Ga. Twenty-one years later, at Morehouse, Lawrence Carter became the founder and Dean of the Martin Luther King Jr. International Chapel, the world’s largest religious memorial to the legacy of the great civil rights leader, whose mission is to teach, encourage, and inspire ambassadors of King’s beloved world community. Carter has spent his career working to realize King’s vision for peace and justice through education and action, including lectures at universities and seminaries around the world. Dedicated to interfaith dialogue, Carter has spoken to Jewish, Islamic, Hindu, and Buddhist commu In 1958 Martin Luther King Jr. privately recruited Lawrence Edward Carter as a 10th grader to come to Morehouse College, King’s alma mater in Atlanta, Ga. Twenty-one years later, at Morehouse, Lawrence Carter became the founder and Dean of the Martin Luther King Jr. International Chapel, the world’s largest religious memorial to the legacy of the great civil rights leader, whose mission is to teach, encourage, and inspire ambassadors of King’s beloved world community. Is this you? Let us know. If not, help out and invite Lawrence to Goodreads.